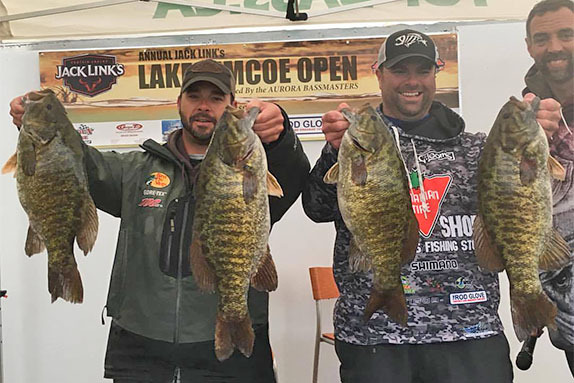 Jason Clay and Matt Belzil have fished the Lake Simcoe Open since 2010. It’s a special tournament, Clay says, and annually attracts some of the best bass anglers from across Ontario. They’ll never forget the 2017 version. Clay and Belzil, both of Niagara Falls, Ontario, broke the Canadian record for a five-fish limit in a tournament with a 31.84-pound stringer – all smallmouth – to claim the win at Simcoe on Saturday. The previous record of 31.55 pounds was set at the 2010 Simcoe Open by Joey Muszynski and Mark Moran. Simcoe is a natural lake approximately 50 miles north of Toronto that covers roughly 280 square miles. It’s known for its world-class smallmouth fishery. Nearly three years ago to the day (Oct. 24), Ontario pro David Chong caught an 8.02-pound smallmouth while out fun fishing with a friend. Clay and Belzil (pictured, left) had a three-pronged approach to the day. They drifted with the wind to maximize stealth. They initially casted to key spots with tubes, jerkbaits or a drop shot. As the boat drifted over top of a waypoint, they switched to a drop shot. As the boat drifted past the area, they fired out deep-diving crankbaits or 4-inch Set The Hook tubes (green-pumpkin) behind the boat and drag or stroll the. Both favored G. Loomis NRX and IMX spinning rods and Shimano reels spooled with PowerPro braid and 7- and 10-pound Sunline Super FC Sniper fluorocarbon leaders. Crankbaits were strolled with Shimano Cumara rods and 10-pound Sunline Shooter fluorocarbon. Targeting flats, points and big boulders in 20 to 42 feet of water produced about 30 smallmouth and another 10 that never made it to the boat. Before noon, that 5 1/2-pounder was culled in favor of another one over 6. Clay and Belzil weren’t the only ones who had memorable days. The runner-up team of brothers Ryan and Callum Johnson sacked 31.06 pounds, including a 7.29-pound kicker smallie. Steve Rowbotham and Sebastian Roy claimed third with 30.13 pounds. The tournament drew 40 boats. In addition to a $7,800 cash prize, there is an additional $20,000 bonus award pending for Clay and Belzil for breaking the Canadian tournament record. The tournament scale measured in tenths of a pound, not ounces, making the matter a bit trickier.